I've tested the wacom-dkms module with my HP tm2 convertible tablet. Touch input and multi-touch are working great. 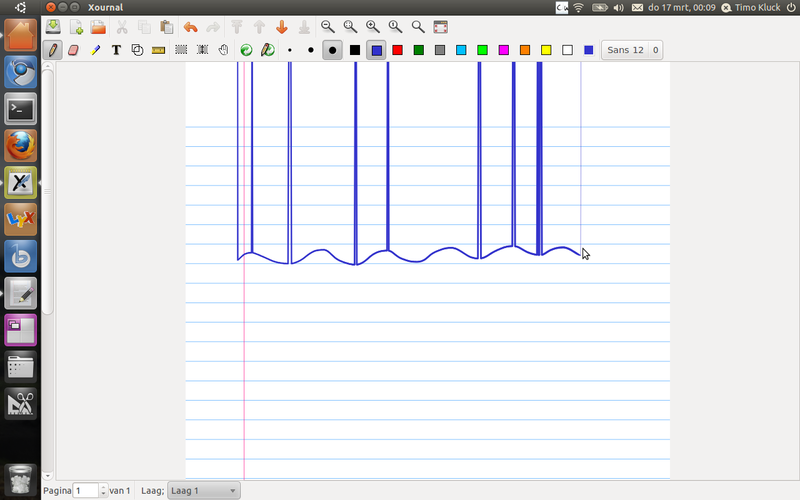 However, pen input is very shaky. It seems as if every now and then, a wrong y-coordinate is registered. See the attached screenshot. My device info is in this bugreport: https://bugs.launchpad.net/utouch-grail/+bug/662957. Please let me know if you need more info. Please attach a copy of your Xorg.0.log file. The files in the previous report do not show any wacom hardware. I just did some extra testing: the erratic behaviour only occurs when moving the stylus horizontally, and disappears entirely when I apply maximal pressure. Some mixup of the axis / overflow? The log file verifies that the X evdev input module is being used. Here's the requested evemu properties and recording. The recording does not seem to exhibit the irregularities you mentioned. Perhaps it did not occur during this particular recording? Thanks for having a look. I found out how to 'play' the recording. The old recording indeed doesn't show the weird behaviour, but the attached version does. Just one more comment: at first I thought that it could be due to Xournal, because it has some weird event handling trying to work around xinput shortcomings. But I can also reproduce in the Gimp. The wacom-pen2.record file seems fine here, and looking through the file, there is nothing special happening with the y axis (grep for "0003 0001" in the file). In other words, this might still be due to some other fu in your system. Here's an xinput test recording. What strikes me as odd is that there are motion events with only an a coordinate, and no a coordinate. This seems related. # what is happening here? The evdev protocol only sends changes, so this is perfectly normal. As far as I can tell now, gdk_event_get_coords() returns garbage y coordinates exactly when these events occur. Some layer between evdev and the application should be keeping state to be able to return correct coordinates, and this is probably what is going wrong. Which layer is this? Is it X, GDK, or should the application (Gimp, Xournal) do this? The fact that the problem does not show up in the a different desktop setting means the problem seems to be related to something else, possibly simpler to fix. That is good news. I would recommend trying the next level now, X. Try logging into a safe mode session and see if the problem persists. Sorry Henrik for my miss-spelling your name. Thanks for your help, I'll see what I can find out and report the bug elsewhere if needed. There are a few things that I could imagine cause this behavior in natty, but like Henrik I can't reproduce this bug either. You wouldn't happen to be running any other gesture or input-related programs like easystroke, would you? Chase: I'm running cellwriter. I will try to disable it and see what happens. My girlfriend has a different Wacom tablet, so I will see if I can reproduce this with her hardware, too. I will also try a live-usb (+utouch ppas). I'll post my results here when I've gotten round to it. One more thought: is 'use xinput' enabled in your copy of Xournal? When I disable it, the problems disappear (but there is no pressure-sensitivity then, so this is no real workaround). I can reproduce this problem on a fresh daily live-usb with only xournal and ppa:utouch-team/unstable as extra software. I uninstalled xserver-xorg-input-wacom to make the evdev driver take over. I can reproduce it both with my tablet's built-in wacom, and with my girlfriend's Bamboo Pen&Touch. I attached her device's properties in case it is of any use. Please let me know if there's anything I can do to help track this down. This trivial patch to xournal is a workaround. The surrounding code (a function called 'fix_xinput_coordinates') suggests that this bug has existed (in xinput? gdk?) for some time already. It just manifests itself slightly differently with these new packages, which makes Xournal's workaround fail. I will submit this patch to Xournal. For some reason, I can now reproduce the bug. What I have verified is that the XInput 1.x events look to be generated properly. However, they are likely only now being sent without all the valuators set in every input event. This is a change in the X server 1.10. The protocol has always said this was a possibility, but it never actually did this until now. I haven't read all the code for this yet, but I will review your patch as a starting point. If I had to guess, I'd say the bug lies in the gtk+ xinput 1.x code. I was only able to reproduce the issue in gimp when I set the preferences for the wacom device so that it would be used in windowed mode. I have also been able to confirm the bug in xournal when using XInput (and possibly also when not discarding core pointer events). Chase: thanks for looking into this again. I also had to explicitely configure the Wacom device in the Gimp. One would also do so in a real use case, for the pressure sensitivity. Your guess about where the bug could be sounds reasonable. Let me know if there is anything I can help you with. In XI 1.x, the protocol sends a range of changed values. If axis 0 and 2 change, 1 has to be sent with it. Since Y didn't change, axis 1 is being sent with a value of 0. It needs to send the previous value in this case. The good news is that the fix shouldn't be too difficult. I will probably get to it early next week. I have uploaded a new xorg-server package to the utouch-team/unstable ppa (version 1.10.0-0ubuntu3~utouch1). I have verified that it fixes xournal usage when playing back the attached recording. I'm going to unlink the upstream Xournal bug because it is really about a different issue. You can create a new bug against just the Xournal Ubuntu package and link it with the upstream bug there if you like. Upstream has accepted the patches for the fix, and I've added the patches to the ubuntu xserver packaging tree for inclusion in the next upload. * Fix jumpy cursor in XI 1.x applications.